Commodore C64 Cart. 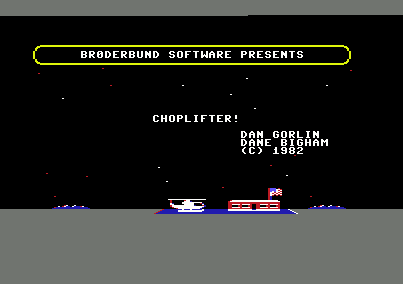 published 37 years ago by Broderbund Soft., Inc.
Choplifter! © 1982 Broderbund Software, Incorporated. Most of us would like to be heroes. Trouble is, we're often not properly prepared when the chance to do something heroic comes along. This is your chance. In the area which lies a few miles east of Patagonia and to the south of Kurdistan lies the Bungeling Empire. This nation of militaristic ideologues has kidnapped the 64 delegates to the United Nations Conference on Peace and Child Rearing. An ancient treaty between the United States and the Bungelings allows the U.S. to maintain a mail distribution center near where the hostages are being kept. You have smuggled an entire helicopter into the post office by disguising it as a mail sorting machine. Suddenly you hear the sound of explosives. Looking out on the plain you see one of the Bungeling's barracks aflame. The hostages are running about frantically, desperate for a chance to escape. Bungeling planes and tanks are fast approaching and lives may be lost. Your chopper is ready to go and fully armed - there is no time to waste. Please purchase this package immediately. Read the instructions for operating your helicopter, and lay out your plans for rescuing these innocent people. Then get to it. Don't blow it. Being a hero isn't easy or everybody would be one.